BeautyScraps: Alternative Card Idea #2: Christmas Card using August 2017 Paper Pumpkin Kit Giftable Greetings by Stampin' Up! 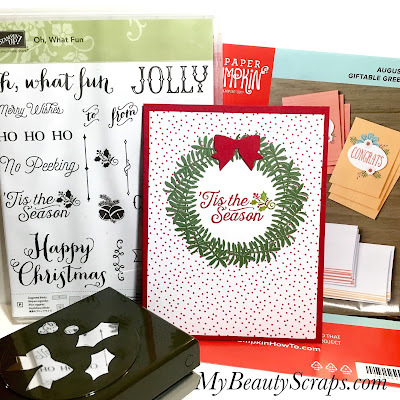 Alternative Card Idea #2: Christmas Card using August 2017 Paper Pumpkin Kit Giftable Greetings by Stampin' Up! August 2017 Paper Pumpkin Kit! This month's kit is called "Giftable Greetings" and it is designed to create a boxed set of greeting cards that you can give as a gift! I love giving sets of my handmade cards as gifts so I was beyond excited to create this month's projects! In Paper Pumpkin's video below you can see everything included in the kit this month and how to create the projects as they were originally designed. I love creating the projects as they are designed, but the real fun for me is coming up with other ways to use the materials we get in our kits. Even after you create the projects that the kit is designed to make, you still have your stamp set & ink pad to use over & over again on other projects. And, this month we had a lot of leftover bits to use on other projects. I have a lot of leftover flower die cuts, sentiment ovals, leaf stickers and ribbon so you know I'm not going to let those go to waste! I'm going to use them to create what I like to call "bonus cards." 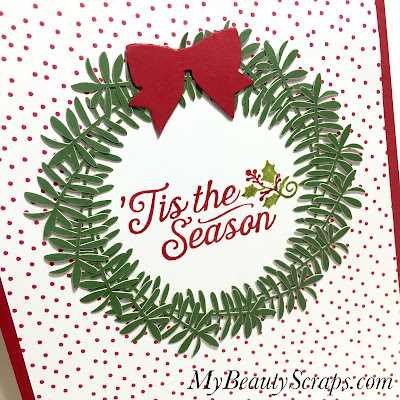 In the video below, I share how I created this simple, quick & cute Christmas card using the leftover leaf stickers and a few other items & tools that I had on hand. If you are not yet a Paper Pumpkin Subscriber you really should get in on the fun! I love getting a creative surprise in my mailbox every month! 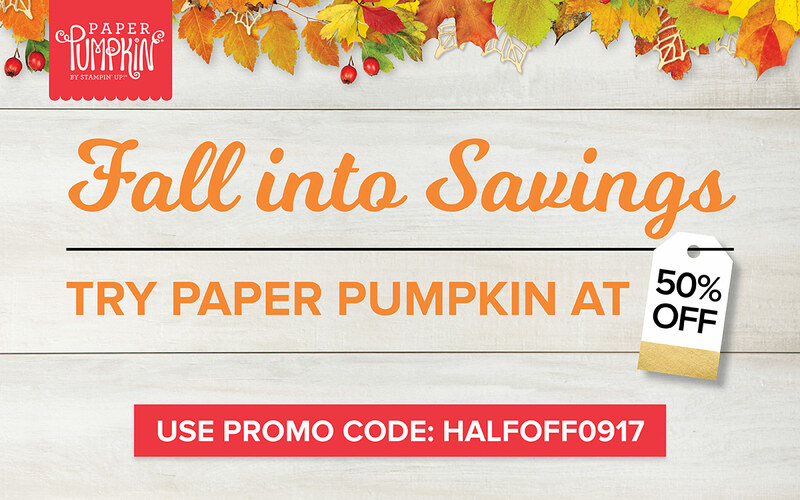 If you would like to learn more, check out my Paper Pumpkin Perks & FAQs! I would love to be your demonstrator and answer any questions you have. Feel free to Contact Me anytime! There is an awesome promotion going on right now for first time Paper Pumpkin Subscribers! Click Here to sign up and enter the Promo Code: HALFOFF0917 and you will save 50% off of your first kit, which will be September's kit! The normal monthly subscription price is $19.95 including shipping so you will get your first kit shipped right to your door for less than $10! Sign up by 9/10/17 to take advantage of the sale! Use Host Code: XWCHFR4P when you shop my online store in August 2017 for a Free Gift!